Limited edition, signed by the author! The last woman on Earth is long dead. The moon has just broken in two. In the aftermath of both events, the male survivors are left behind to question love, masculinity, and fate. How do they go on without women? What’s the point? What does it mean to exist in this strange new universe, which seems to be breaking down? This short story, “Stopping to Talk to Porch Lights When the Moon Is Not Enough,” is just the beginning of Life on Other Moons. Later, in the title story, a civilization on the moon begins to rebuild after decades of civil war. The first step? To build a bridge between the two halves of their broken home—and search for survivors. Three other stories in the book follow the progress of a boy and his father on their multi-year journey from rural, 1960s Alabama to a war-torn Vietnam and ultimately to the moon. But the moon doesn’t dominate every story. 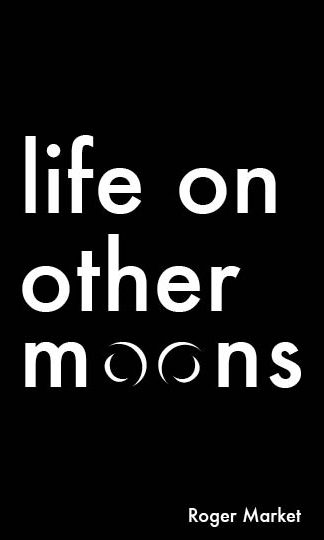 Life on Other Moons is the debut fiction collection from Roger Market. It was first published in simultaneous limited editions in May 2013 (paperback and handmade). It’s also available as a FREE e-book at Smashwords, Amazon, B&N, and other major retailers.